Searching for inspiration? Trying to create a memorable name for your company but struggling to come up with original ideas? 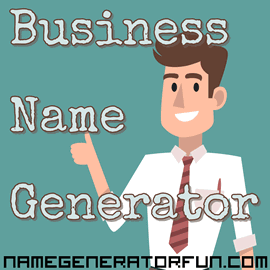 We can help get you started with our business name generator! Often, business names can be found just through names of the founders of the company – as in the case of the toy-company Fisher-Price, combining the names of two of its founders (Herman Fisher and Irving Price). This is also the case with car company Ferrari (founded by Enzo Ferrari), kitchenwear manufacturers Kenwood (founded by Kenneth Wood), fashionwear company Prada (named for founder Mario Prada in 1914), or the car company Peugot (formed by Armand Peugot in 1896). Acronyms are also an effective method that's been used many times in the past, such as with American insurer Geico (which originally stood for Government Employees Insurance Company), international bank HSBC (short for Hong Kong & Shanghai Banking Corporation), delivery company DHL (named after its founders, Adrian Dalsey, Larry Hillblom and Robert Lynn) or IBM (which stands for International Business Machines, and was named so because IBM's founder, Tom Watson Snr., wanted to best his ex-employers, National Cash Registers). Combination names work well, especially in Europe. Budget supermarket brand Aldi got their name from combining 'Albrecht' – the name of their founder – with the word 'discount', while furniture titan Ikea was named via their founder Ingvar Kamprad combining his initials with the first letters of the farm and village where he originally grew up, Elmtaryd and Agunnaryd. Lego, the company that creates the immensely popular plastic bricks, also got their name by combining the two words of the Danish phrase 'leg got', which means 'play well'. There can be other reasons behind your choice of business name – like with Amazon, which was renamed by Jeff Bezos from the original 'Cadabra.com' partly for the associations with the mighty South American river, but also because it would automatically appear near the top of any alphabetical lists of companies. This reason was also used by the Amiga Corporation, developers of the Amiga computer, who wanted a name that would appear above their competitors Atari and Apple, and also chose the name because it means 'female friend' in Spanish and Portuguese. In other examples, the name can be chosen because of a historical context – like the car company Cadillac (which was eventually taken over by General Motors, but which survives as a car brand name). The Cadillac company was founded in 1902, and was named after Antonie De La Mothe, sieur de Cadillac, a French explorer who originally founded the city of Detroit in 1701. There is also the car manufacturers Tesla, who are named after the Serbian electrical pioneer Nikolai Tesla (especially because they utilise the same basic AC motor technology originally developed by Tesla in 1882). Alternately, there's always the option of going for a more mythical angle; like Arm & Hammer, a brand which was named after the arm and hammer of Vulcan, the god of fire, volcanoes and metallurgy; or computer manufacturers Asus, who are named after the mythological winged horse Pegasus, except with the first three letters dropped (as with Amazon, so they would appear higher in alphabetical lists). Sometimes it can be something as simple as a location – like with printer and typewriter manufacturer Lexmark, who were initially based in Lexington Kentucky and were set-up under the codename Lexington Marketing. Or it can even be random, like with UK retailers Dixons, who were named in 1937 when Michael Mindel and Charles Kalms opened a photographic shop but only had room for six letters on their sign, so the name 'Dixons' was chosen from a phone book. Creating your brand name with the help of a business name generator is of course one more option! Whichever route you choose, always be prepared to explore different possibilities with your business name, canvass opinion from multiple sources – and leave yourself open to embrace the unexpected! Image Credit: Business man designed by Freepik. Licensed under CC BY 3.0.